The Spirited Walker: Fitness Walking for Clarity, Balance, and Spiritual Connection, by Carolyn Scott Kortge, gives me guidance about walking and breathing. Kortge was a presenter and a workshop leader at the Life Beyond Cancer Retreat at Miraval when I attended two years ago. I’m not a fitness walker, but I turn to Kortge’s book for help and inspiration. Walking might be the one best thing that I can do to improve my health, reduce my risk of recurrence, and increase my sense of well-being. When I returned from six weeks of radiation treatment and felt fear and panic intrude into my day, I grabbed a jacket and headed out the back door to walk it off. Sometimes I drove into town and walked the sidewalks around the lake or the fishing pond. Or I drove up to the farm, left my car, and headed down the gravel county road, sometimes veering off on a pivot road into the middle of a field, then back to the car. Once I didn’t want to worry about calculating how far I could go before needing to turn back so I called a relative and said I was walking as far as I could, then I would call them to pick me up. Sometimes I walked and counted my breath. Sometimes I counted my steps or followed other of Kortge’s directions. Sometimes I walked counterclockwise around the walking path and prayed, then realized I was meeting serious fitness walkers going the other directions, knees and elbows pumping high. I went through a time this year when I didn’t feel well and I was depressed and I didn’t walk. I believe if I had walked during that time, I would have been better much sooner, both physically and emotionally. Walking and breathing fills us with a life force. Kortge discusses that connection between between breath and spirit or life. As a cancer survivor who is constantly learning how to be vigilant for signs of a recurrence without being anxious over every physical change, I can use all the help I can get to become a better listener for the information I receive from my body. Walking and breathing are not just good for me, but may help me learn a new way of being a survivor. I’m going to re-read Kortge’s book. And I am going to walk somewhere, somehow, each day, whether it is on a treadmill when the weather is bad, through the fields in the sunshine, down a gravel road, up the sidewalks in town, down a fence row, or up and down the stairs in my house. This morning when I went outdoors, there was a dusting of snow on the ground. 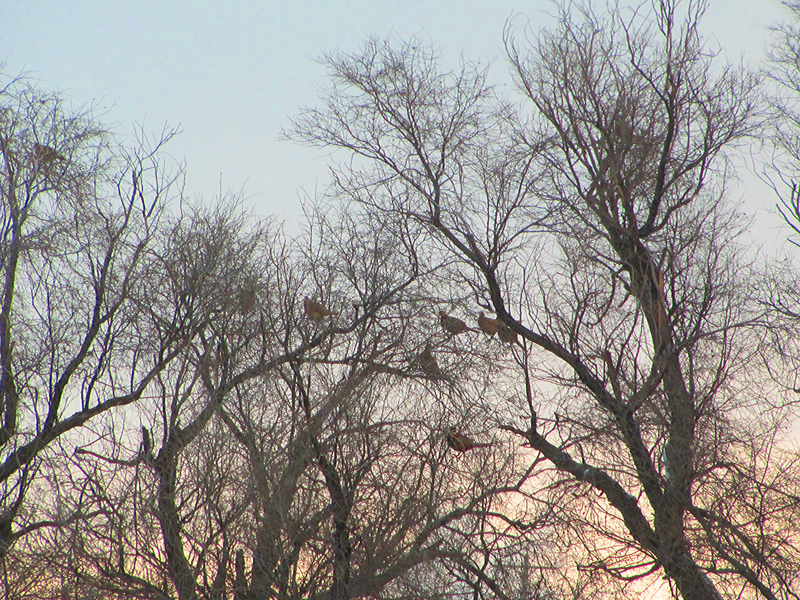 The pheasants came out of the newly harvested cornfield and flew up into the tops of the trees. I took a photo of them against the pale morning light. Later, I saw them hurrying past my house, headed for a wheatfield. I’m touched, Carolyn, that you read this post. Have a great time at the retreat this week. Wish I was on my way, too. Take photos! I’m looking forward to your new book.